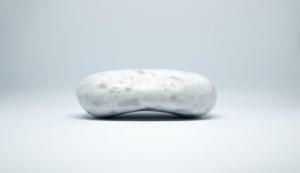 A beautifully designed calming pebble. Supported by a mindful community, hardware designers and mental health experts. 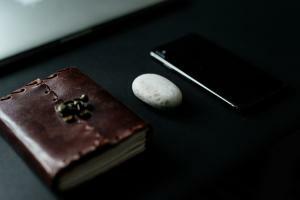 LONDON, LONDON, UK, April 10, 2019 /EINPresswire.com/ -- Making mindfulness accessible and easy for everyone, Moment Pebble announces they have developed a product designed to bring short, mindful moments into the lives of busy people. Away from screens and notifications, identified as one of the biggest sources of stress today. Being busy has become a badge of honour. This busy phenomenon is impacting society as people are sacrificing their wellbeing in an endless search for bigger, faster, now. At the expense of people’s health - both physical and mental - society is absorbed in the need to always be ‘on’. “Even those people who use excellent mindfulness tools like the Headspace or Calm apps tend to use them in the morning or evening. However, it’s during the day that we are the most stressed. We designed the Moment Pebble to be a simple tool to reduce stress during these times, and ultimately improve overall wellbeing in the long-term.” says Charlie Cadbury, co-founder of Moment Pebble. The Moment Pebble is an all-in-one tangible tool. Acting as a physical mindfulness enabler, giving minds short, frequent breaks which can be subtly included into a day. The Pebble fits in the palm, a pocket or a bag, activated by movement, with a hypnotic glow that draws the user’s focus for thirty seconds (a moment). Using a low energy design, the Pebble lasts a fortnight before needing to be charged. For ease of use, it recharges wirelessly on a 'charging stone' which itself sits un-tethered, only requiring to be recharged every couple of months. It’s pocket-sized (6cm x 4cm x 1.5cm) and weighs just 60g. The design is driven by research indicating that thirty seconds of mindfulness helps kick people off autopilot and draw them into the present. Benefits of taking moments include: reduced feelings of anxiety and stress, boosting brainpower and creativity as well as improving sleep. Whilst in the longer term encouraging feelings of clarity, calmness and wellbeing. The Moment Pebble is available for pre-order on Kickstarter. This crowdfunding campaign started 9 April 2019 and runs through to 9 May 2019. Pricing for the Moment Pebble begins at £40 with an RRP of £60 when it hits the shelves later this year. Co-founders, Alex Strang and Charlie Cadbury met working at a digital agency in the early 2010’s. Discovering a shared appreciation of mindfulness, they both recognised how giving their busy brains a mindful break would create space for innovation and motivation. But despite all their best intentions, they would continually fall out of their mindfulness practice. This inspired them to create the Moment Pebble. Moment Pebble are on a mission to develop products that help bring mindful moments to busy lives – making them accessible to everyone, everywhere. The Moment Pebble is the first step. They want to start a Moment Movement – to promote micro-moments of mindfulness that helps people all over the globe stop and take a mind break. The Moment Pebble has received great accolades from leaders in both the tech and mental health arenas. Initial investment and research have been provided by the Central Research Laboratory which has allowed the team to develop a product that truly will create impact. Plus, growing support from mindful organisations like the Body & Soul Charity. Feedback from users who tried the Moment Pebble ahead of launch includes a very positive review from Hamish Grierson, co-founder at blood health home testing company, Thriva. “People and organizations across the board understand the importance of getting off auto-pilot and slowing down. Mindfulness is a necessity and more are taking note. The mindful include the likes of Google, to Kensington and Chelsea council, all the way through to the European Central Bank. The NHS is funding mindfulness sessions as an alternative to pharmaceuticals. Ruby Wax helped launch an all-party mindfulness group in parliament. Happiness guru Richard Layard is all for it. Madeleine Bunting has suggested in the Guardian that it should be mandatory in schools.“ says Charlie Cadbury, co-founder of Moment Pebble. “It seems counter-intuitive to want people to engage with their phone, to disengage from the world,” says Cadbury. “We’re a society dominated by a need to be online, to be checking, to be robotically stimulated. 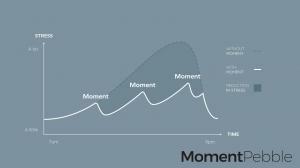 We wanted a solution away from that.” says Charlie Cadbury, co-founder of Moment Pebble.